Some kids love the ice cream truck. Not me. (Ok, I did, who am I kidding....but not as much as what's to come...) Growing up, one of my favorite things ever was the man who would come around our neighborhood every afternoon with fresh steamed corn on the cob. Well him, and the guy with the fresh mango-on-a-stick. But that's a different post. I would honestly look forward to the days I would hear his cart after school: those bells jingling and his voice screaming, "Corn!" Upon hearing, I would run to whatever parent was home and beg for some money so I could run outside and catch him before he left. And I mean, for a whopping dollar, you got one of the best snacks ever. Reach in and grab a cob. Pull back husks, place a skewer in bottom of one side. Twist corn while drizzling on butter (and watch it drip to the floor). Powder on parmesan. Squirt lemon or lime juice all over. Sprinkle chile powder over that. Finish with squirts of mayo. Then he would hand it to me and I would devour in a matter of minutes. Butter and mayo would get everywhere, parmesan would be stuck to my cheeks, there was always corn in my teeth...but I was a happy camper. Best. Ever. My sister and I were talking about this very memory a little bit ago and it got me thinking, "Why haven't I tried to recreate this childhood staple yet?!" I mean...that's like the first thing I should have ever made. 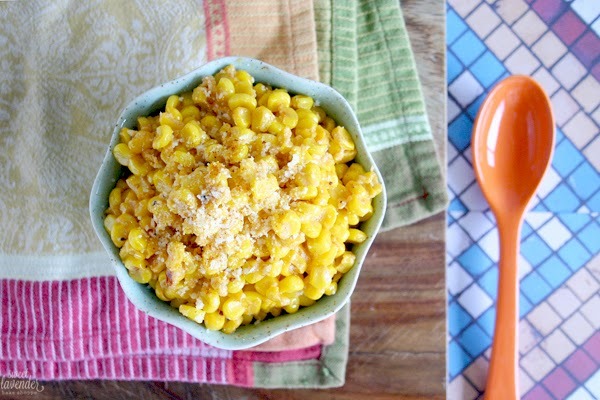 Being a summer staple, fresh corn on the cob isn't at it's peak yet. So I opted to go the frozen route. 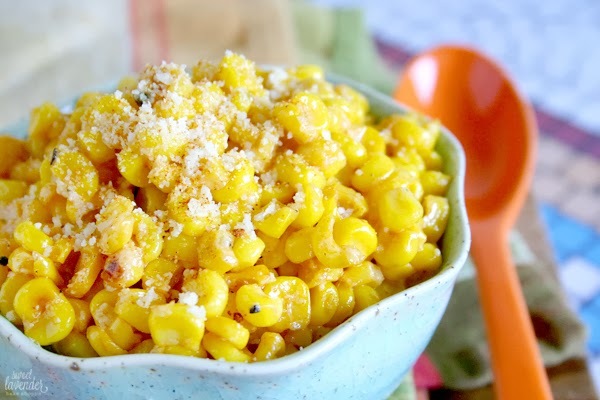 Plus, it's easy and plus plus- frozen corn is always around! Oh, and plus plus...plus? Eating this in a bowl eliminates those pesky bits in your dental grill. Score. 1. In a large non-stick skillet, over medium high heat, melt your butter. 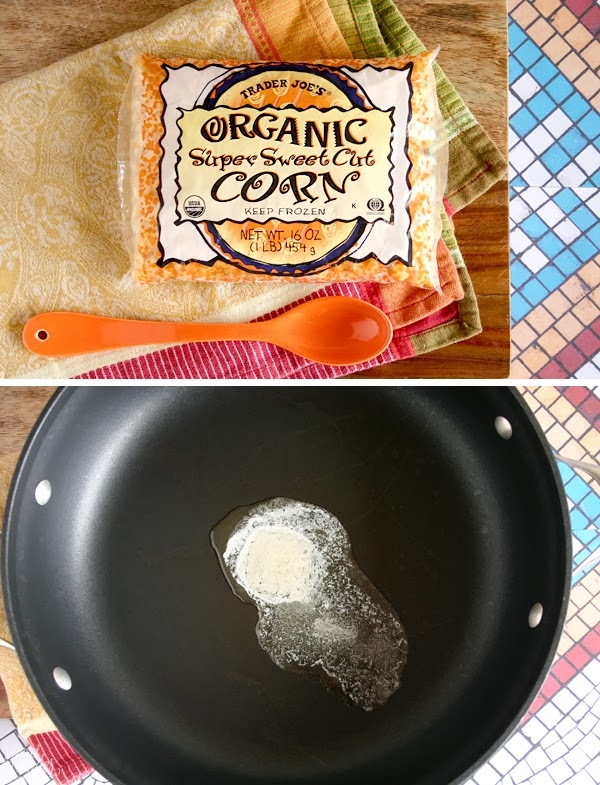 Add frozen corn to pan and stir. 2. Add salt, pepper, cayenne, and paprika to pan and stir to evenly coat. 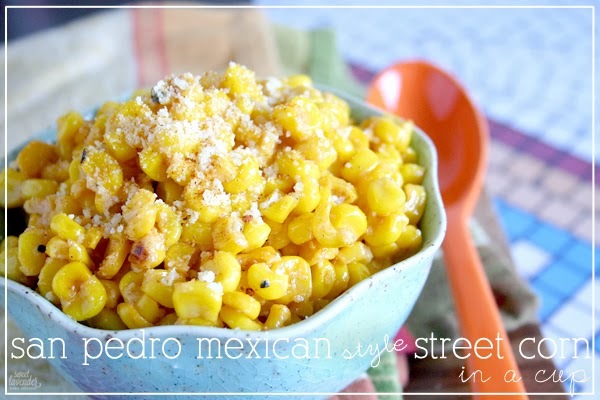 Allow to cook, over medium high until corn is cooked through and any/all water has evaporated, 9-10 minutes. Stir occasionally. If you like things really hot, feel free to add more cayenne pepper. Alternatively if you're not a fan, feel free to leave it out altogether. 3. Turn off heat and add lemon juice, mayonnaise, and grated parmesan. Stir to combine and serve immediately! Optional garnish: sprigs of cilantro! Easy right? So easy. In about 15 minutes you'll have one of the best side dishes your little taste buds will ever have experienced. It's like you and I just time traveled back to the 90's and became best friends. Just imagine us hanging out together, wearing white washed jean shorts, jellies, and Bugs Bunny shirts after a grueling day of elementary school. Imagine the day getting THAT much better after a snack like this. So happy to now have a childhood memory (in the form of food) at my fingertips. We've already made this twice (haha) and I can't wait for another piping hot bowl. By the way guys, the winner for the 1 pound bag of Ceylon Cinnamon was just announced! Was it you? 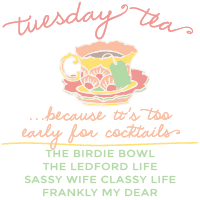 Linking up today with the lovely Birdie Bowl in her Tuesday Tea and Eat Drink and Be Mary's Delicious Dish Tuesday! I love that you shared this. I love corn, as in I'll eat it out of a can with only salt. But this recipe sounds MUCH better than the one I mentioned. Can't wait to try it, I'll be pinning it to my pinterest board. Thank you so much for linking up with us at Delicious Dish Tuesday!! We hope to see you back this week with another amazing recipe to share! Ready to have your mind blown? We also had a tamale man AND a mango-on-a-stick man! The mango was another favorite- fresh, peeled whole mangos, on sticks, ready for whatever topping you wanted as well. My fave: chile, lime, salt. Boom. So good.